There’s one drawback to the warmer weather. Bugs. Nothing can spoil a perfectly good walk in the woods like swarms of mosquitoes buzzing in your ears. Don’t despair, though. I have the perfect solution to fix all your summer bug blues! Enter Bug Soother. This product first appeared on my blog last summer (see the post here). I truly love this product. It repels gnats, no-see-ums, sand fleas, black flies, mosquitos, and more. And smells great! I’ve handed out samples to friends, family, and co-workers. Everyone comments on how nice it smells. It’s safe for kids and pets too! Big thanks to my sweet sweet niece for modeling this fabulous product! Inadvertently, I put this product to the test a couple weeks ago. The ticks are thick this year. Seriously, they’re everywhere. Normally when I go hiking, I put on Bug Soother and a tick repellant as Bug Soother doesn’t specifically say it repels ticks. Welp, there was no tick repellant to be found in my house. I had no choice but to proceed on my hike with just the Bug Soother. With the Bug Soother in tow, the puppy and I set out on our adventure. It also happened to be mushroom season, so we left the beaten path and scoured the tall grass and woods for the elusive morel. We didn’t find any mushrooms. 😔 On the other hand, though, we didn’t have any ticks! 😊 Bug Soother for the win! Interested in trying Bug Soother? Head on over to Bug Soother and enter the code ‘MissyAnnIA’ for 25% off your first order. You’ll be happy you did! Summer just won’t let go. It’s holding on tight! As much as I would love to breath in that crisp fall air, I’ll enjoy the extended summer while it’s here. Besides, that gives me a second chance to try out any summer outfits I didn’t get to yet. I took to Pinterest to see what inspirations were still waiting to be recreated. Luckily, I found this number. Normally, I wouldn’t pair dark denim with black. The inspiration photo made it look okay, though, so I just went with it. For the restyle, I used the concept of the inspiration pic with a summer spin. I exchanged the long skirt and long-sleeved shirt with a short denim skirt and a black tee. Instead of the orange pops of color, I opted for pink and wore a necklace instead of a scarf. Some strappy, black heeled sandals finished off the look nicely. I gotta say, I’m digging this outfit. It’s one I’ll have to remember next summer for sure! Are you holding onto summer or are you ready for fall? Finally, we’re back feeling refreshed after a little hiatus. This summer has been crazy! Thanks for hanging in there with us! We’re trying something new this week. Stay tuned; I think you’ll enjoy it! For now, let’s get into today’s outfit. Today is the unofficial last day of summer. I can’t believe how this season has flown by! Every year I seem to fall into the same pattern. I realize the warm weather is quickly drawing to a close and there are still so many summer outfits I want to try. I’m loving this kimono trend and I love how it’s exemplified here in the inspiration photo. The pinks work so well together making a seriously bold statement while the rest of the pieces fade to the background giving this outfit a fabulous pop of pink. We all know how I love a good pop of pink! 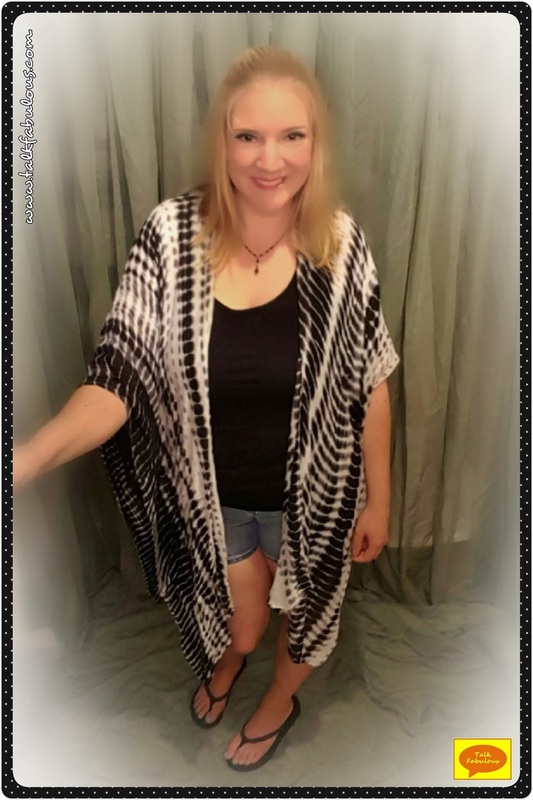 My ruana (aka my kimono alternative) is black, white, and gray. You know the one; it’s been featured here. So instead of a pop of pink, I went for a pop of black. I really like the end result, plus it’s functional too. Getting too hot? Remove the ruana and put it in your purse. It folds down quite nicely for that. I love when function and fashion meet and I love this outfit. I hope the kimono trend sticks around awhile! That’s all for today. I’ll see you guys in my next post! Have you ever had one of those “why didn’t I think of that” moments? Well, if you’re like me, then you have them quite often. I had two while I was putting this outfit together this morning. If that says anything about the trajectory of my day, I might be in trouble. No matter, I have a fabulous outfit and some bright lipstick, so I can basically conquer anything that’s thrown at me. Let’s get into the outfit! The inspiration for today’s outfit came from Pinterest. Finally, I was able to find some fresh inspiration there! I was a happy camper and even happier that I could recreate the look. 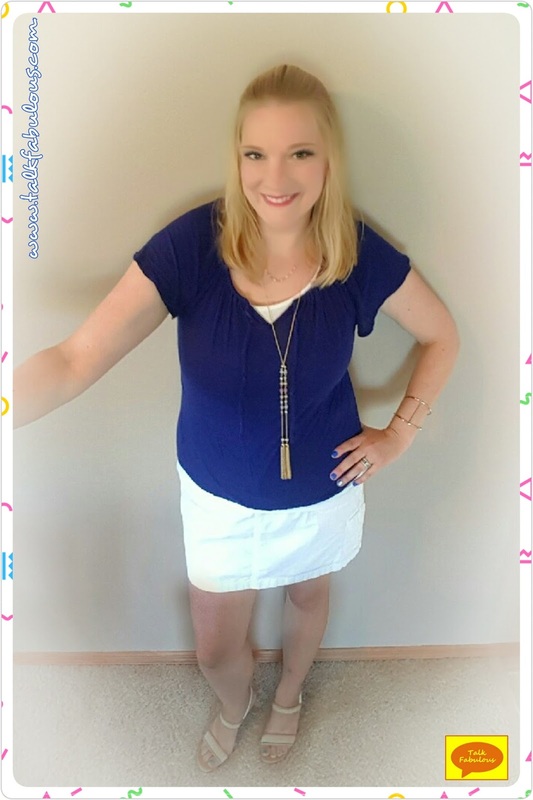 My first “why didn’t I think of that” moment came when seeing the blue top paired with the white shorts, or in my case, a white skirt. Strangely enough, this is something I never would’ve tried on my own. No idea why, but I’m learning and that’s good, right? Copying the accessories as well, I put on my tassel necklace which I was so excited to wear! The only problem was that the necklace didn’t look good with my top. I always tie this top in a bow, always. I’ve had this top for probably 5 years and have never worn it any other way. In order for the necklace to work, I had to untie the bow. I couldn’t believe how much more I loved this top with the bow untied. Moreover, I couldn’t believe I had never thought to try that before! I just love what a good dose of inspiration can do for you! Do you ever have “why didn’t I think of that” moments? Today, we’re talking mega surprises! Hair removal cream, to be exact. Here’s how I stumbled across this beauty. 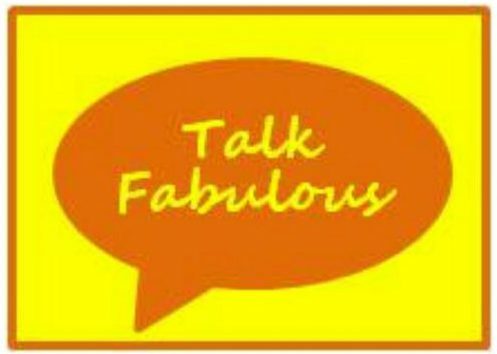 So, there I was at Target wondering around looking at all the fabulous items they have in store. Remembering I needed razors, I found my way to the shaving aisle. Now I’m pretty picky about my razors. I’m lazy so I like the ones that have the shaving cream on them. Those are pricy, though! A refill can run you about $20 for 4-5, maybe 6 if you’re lucky. My eyes just happened to wonder down to the hair removal creams. I haven’t tried a hair removal cream in years. Target had 3 brands all in the $5-$10 range. I figured it was worth a shot to try, especially at that price point. 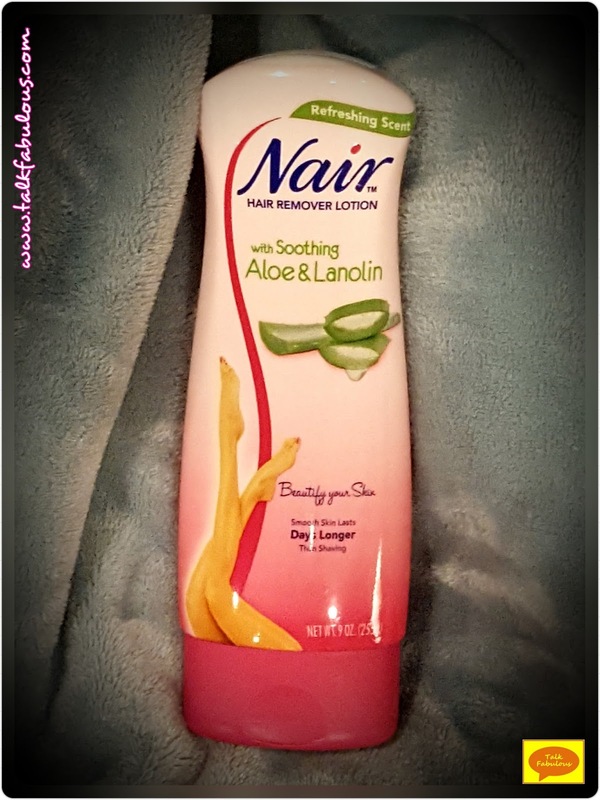 I opted for the Nair brand since it was one I had heard of before and it just happened to be the cheapest one. I purchased it and walked out the door excited for my new experiment. Following the instructions exactly as stated on the package, I began the experiment. It says about 85 times not to rub the product into your skin, so I was careful not to do that. You want to apply a thick layer to the skin and let it sit for 3-10 minutes. I applied it to my legs and let it sit for 5-6 minutes. That seemed plenty long. I’m not going to lie, it burns a little. Nothing terrible, but it’s slightly uncomfortable for the last minute or two. If you’re sensitive to that, you might want to steer clear. Next, I removed the product with a damp washcloth as suggested in the instructions and rinsed the remainder off in the shower. Guys! This actually worked! I think the key is using the washcloth to remove the product and the hair goes along with it! I was truly amazed! I’m not sure yet if this will replace my razor, but it just might. I can see using this product at the beginning of the week and then use an electric razor for touch ups during the week. The product claims to last longer than a typical shave. I’ve used this twice now and once on my underarms and I’m not seeing the longevity they speak of. It might last a day or so longer, but not more than that. All and all this was a successful experiment! I would recommend trying out a hair removal cream for yourself! Do you use hair removal creams? Any suggestions for us? Festival season is in full swing. From open air concerts to fairs galore, there is a lot going on for the remainder of the summer. How is one to dress to look stylish and yet keep cool in the sweltering summer heat? Don’t worry, I’ve got you covered. Here are three festival looks to keep you looking your best while staying cool. This is a good look if you don’t want to wear a dress. I have on jeans, but you could do Capris or jean shorts. I also love the light and breezy look of the tank top. I also love the funky jewelry. So fun! 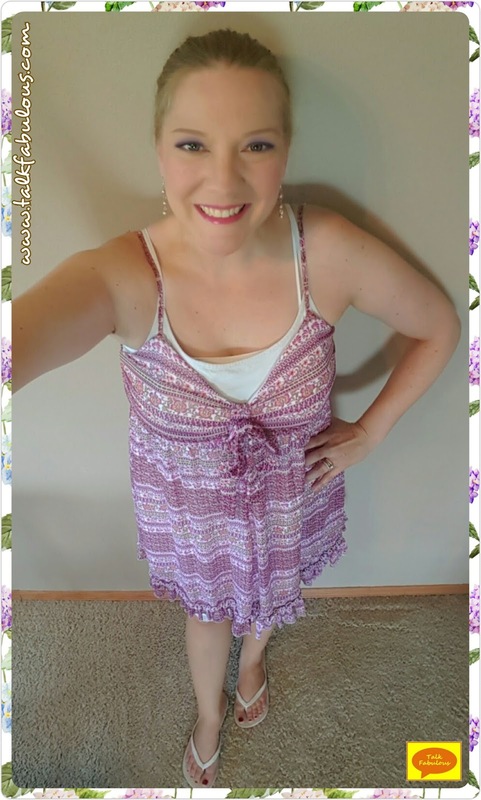 I love, love, love this light and breezy dress. It’s perfect for festival wear as it will keep you cool and looking stylish. This is definitely my go-to for summer fun! This boho-chic maxi dress is sure to keep you cool yet looking fabulous! I love the funky print and the lace detailing on top. Add in the accessories and you have yourself and winning combination! Pinterest is getting stale. I feel like we see the same pictures over and over. This makes me so sad as it has been my go-to for inspiration for years. Just like anything, all good things come to an end. So, I’ve been trying to find new avenues for inspiration. Instagram has risen to the top as one of my new favorite places to find inspiration. Today’s inspiration photo hails from the lovely ladies at EveryDaeStyle on Instagram. I love the simplicity yet super stylish vibe of her look. 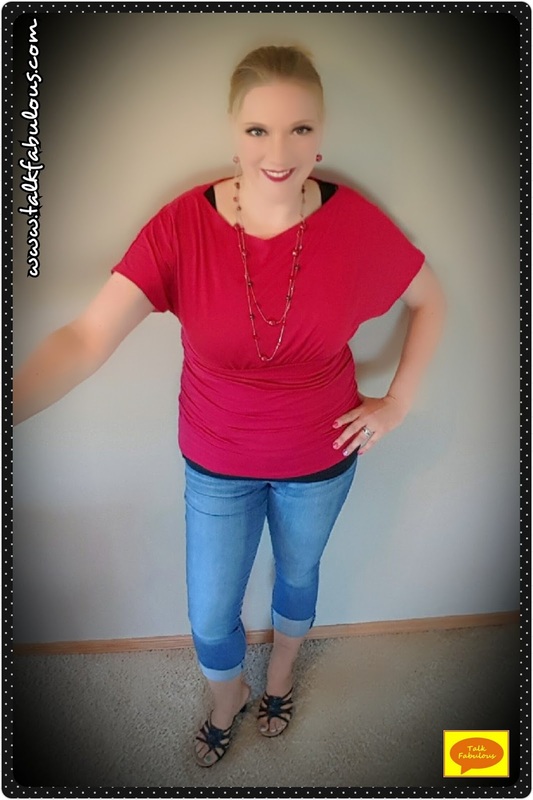 For the restyle, I opted for a black shirt and red accents. I also did the half tuck of the shirt. I find the half tuck incredibly difficult to master, so I almost never wear my shirts like that. Anyone else with me on that or is it just me. Just me? Oh okay, got it. This is a super simple look that’s perfect for summer and one I’ll be sure to have on repeat for the rest of the season! Seriously, I need to know, do you half tuck your shirts? What’s the secret to mastering that look? Today, let’s get fancy! How fancy is this inspiration photo?!? I love how it combines elegance with summer practicality. The look is borderline genius in my opinion. I know it’s a thing, but you’ll never catch me in Bermuda shorts. Never. They’re just not flattering on me. Instead, I opted for some Capris, which still give the outfit that summer vibe. I paired it with a red shirt much like the one in the inspiration photo. For accessories, I opted for a beaded, red and burgundy necklace with matching earrings. I added some heeled, black sandals as the final touch. My look didn’t come out as fancy as the inspiration pic, but I’m still loving the look. You could easily dress this up by adding fancier pieces or dress it down too. 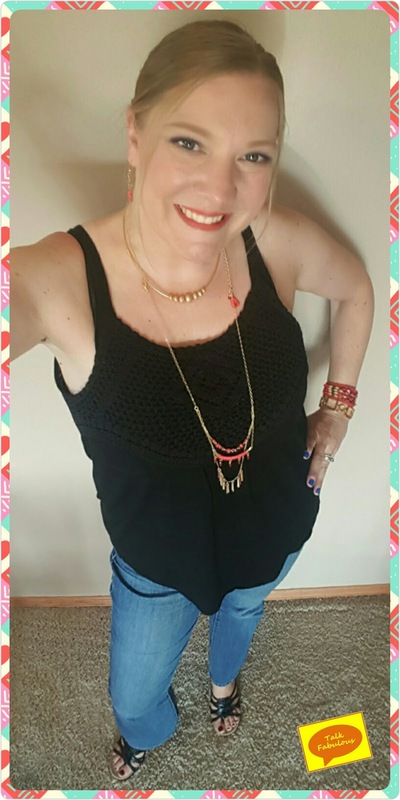 I love outfits that give you that versatility! 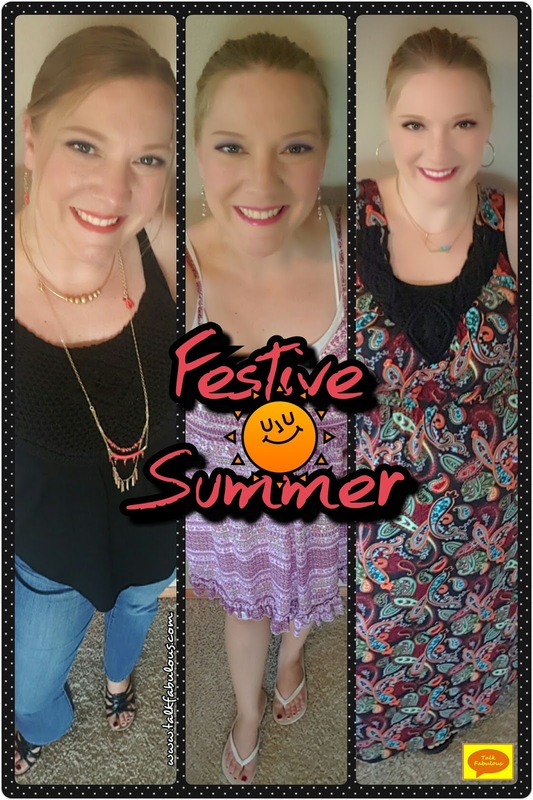 What’s your fancy summer outfit?